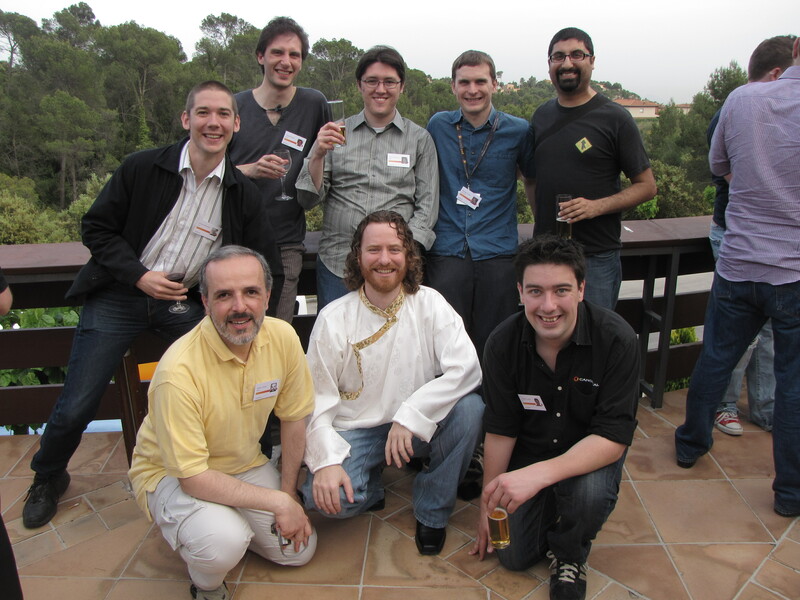 The title of this quick little post goes to the excellent name mwh gave the linked photo :-) Taken at a dinner during AllHands in a gorgeous area outside of Barcelona, this pic shows the collection of Twisted developers that Canonical has hired (so far!). Top row, left to right: Andrew Bennetts (spiv), Thomas Herve (therve), Chris Armstrong (radix), Michael Hudson (mwh), Jamu Kakar (jkakar). Bottom row, left to right: Nicola Larosa (tekNico), Duncan McGreggor (oubiwann), Jonathan Lange (jml). It's that time of year again; the time when you all have the excellent opportunity to settle your karmic debt and sponsor the Twisted project. Actually, that time is every day of the year. Right now is just when we have arbitrarily decided to make you aware of this opportunity, so that we're not annoying you all year-round. Sometime soon we'll be taking down the current list of sponsors for 2008 — hopefully, to make room for a new list of sponsors for 2009. But without your help, that list will be empty! Thanks to our founding sponsors, Twisted has had a great year. If you've been reading this news feed, you know that we've been able to review, respond to, and close tons of tickets this year. As Jean-Paul Calderone previously wrote, this is the first year we've had a year-over-year decrease in the number of open tickets; and that's despite an increase in the number of filed tickets. We believe that Twisted is setting a great example for how other open source projects can effectively use sponsorship to fund development. Many open source projects are perpetually crunched for volunteer labor. Twisted is no different in this respect — we could always use more help from the community. However, we are lucky to have something that most projects don't: the ability to convert dollars directly into maintenance that benefits the project. When you contribute money to the Twisted project, you are directly contributing to get bugs fixed, features implemented, and tickets reviewed. Last year we told the same story, but this year we have an excellent track record. I invite you to read the history of our sponsored development — just scroll down and have a look. I'll wait. In case you don't already know: "exarkun" is the handle for Jean-Paul Calderone. By his own calculation, at least 75% of his work this year has been sponsored development. This year of sponsorship has been great for the project. But, we're coming to the end of our first year of funding, and we need your help to keep going. Every little bit helps, from small, one-time individual donations to monthly subscriptions to corporate sponsorships. This year, we need even more help from individuals, as some of our corporate sponsors have been impacted by the current economic climate and may not be able to contribute at the same level this year. Contribute code. Any contribution is welcome, but the best would be to attack an existing ticket in the tracker, especially one that has stalled on its way through review. Donate money directly. You'll find donation buttons on the front page of twistedmatrix.com. Donate money from your organization. Doing so gets you a voice on our sponsors-only mailing list, and can help you to set priorities for the coming year of development. You also get your logo on twistedmatrix.com, our gratitude, and last but not least, more Twisted development in the coming year! Thanks for your interest in Twisted. RFC 3261 is the longest RFC for a network protocol the IETF has ever produced. The SIP transport/transaction branch only provides the bottom two layers of a full SIP stack, but introduces 1700 new lines of code. Special thanks to Chris Armstrong and Jean-Paul Calderone for their amazingly detailed review. I managed to get halfway through the issues they raised, and expect to finish it up next time. Once again, thanks to the Software Freedom Conservancy, all of the Twisted Sponsors, and all the other developers who contribute to Twisted. It is the last of these on which I spent the bulk of the time, implementing the lower layers of SIP message handling as described in RFC 3261. As far as I know, this is the first implementation of this protocol in Python that has thorough unit test coverage! While reviewing the code from Sine, Divmod's SIP implementation, and comparing to the spec I discovered some significant misunderstandings that I had the chance to fix here. This code lays the foundation for both user agent code (like VoIP clients or SIMPLE instant messaging) and proxies. Thanks to the SFC and all of the sponsors who made this possible, as well as to all the other Twisted developers who helped out by writing or reviewing code. On Friday I finished the first two weeks of sponsored Twisted development for 2009. This week, the number of open tickets in the Twisted issue tracker hit 1040 - going down. We hit 1040 on the upside in November of 2007. Thanks in very large part of the sponsors who made so much of my time available for Twisted development in 2008, we closed more tickets than we opened last year for the first time (Drew P quipped that Twisted will be bug-free and feature-complete in 2636 - better than never ;). On average, we closed one ticket every 14 hours last year - all year. This trend is clearly visible in the graph included in the weekly summary of issue tracker activity. The green line shows total tickets filed, the red line shows total open tickets. Of course #886 shows up in the list yet again. At this point the protocol implementation is essentially done. The code has been reviewed and most of the feedback dealt with. The only reason it isn't closed yet is that we want to provide more than just an HTTP/1.1 client protocol implementation. We want to provide an easy-to-use, high-level web client. Before I call #886 finished, I want to implement a few of those high-level APIs. So #886 is going to remain open for a little while longer, but I expect it to be closed very soon now. Changes to the internal factoring of reactors (#3602) and additions to fdesc (#3576) were both made in support of #733 - a very old ticket for a behavior which often trips people up. Glyph did the initial work on these improvements and Itamar and I came back and polished them a bit last week. With one of these closed and the other almost closed, Twisted is getting pretty close to not getting in the way of popen (and more generally, not causing syscalls to start to fail with EINTR). This is a generally nice thing, but it's taken a long time because it requires access to POSIX APIs Python doesn't expose. Several documentation tickets there, as well as some good SIP stuff (more of Allen's work). The digest authentication ticket (#3575) was a nice one. Twisted has something like three different implementations of digest authentication in it, each for a different protocol with slightly different requirements. #3575 is the beginning of the consolidation of that code, a pretty important task. Meanwhile, Allen has been working on the SIP code in Twisted in parallel with my development. A report of his work will show up here shortly.